A rally was expected after crypto markets hit a monthly low yesterday. Traders loaded up and bought the dip and all currencies have bounced back today, however the overall sentiment is still bearish. Bitcoin held support and did not fall below $7,000, it is currently up 5.3% on the day at just over $7,500. Ethereum, after suffering heavy losses, has returned to around $570, up almost 8.5% and altcoins are all in the green. There are several coins in the top 25 posting double digit gains at the moment but Bytecoin is leading them all. Coinmarketcap is currently reporting a 30% jump for BCN which is trading at $0.0067, up from $0.0051 this time yesterday. Over the past seven days all altcoins have lost out and Bytecoin is no exception falling 14% since last Wednesday. This altcoin pumped and dumped on May 8 when Binance listed it and it reached an all-time high of $0.018, since then it has been in decline. Trading against Bitcoin BCN is up 21% on the day to 90 satoshis from 72 sats this time yesterday. Over the week it has lost 9% on BTC falling from 98 satoshis this time last week. 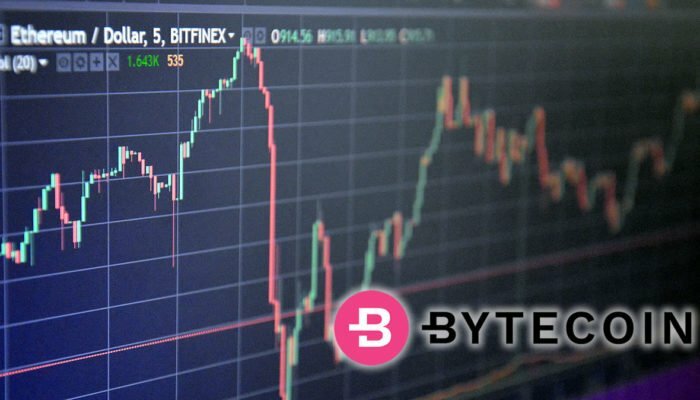 Bytecoin volume has surged in the past 24 hours jumping from around $15 million to over $54 million; this has boosted recovering of this newcomer to the top 25. Currently Binance has the largest share of BCN trade with almost 80%, followed by HitBTC. Bytecoin has crept into the top 20 now with a market cap of $1.2 billion. Almost all of the 184 billion tokens are in circulation and that big volume spike could see prices go higher, up to the 100 satoshi level. Total crypto market capitalization hit a monthly low of $303 billion yesterday. A bounce back has been expected but it remains to be seen whether upwards momentum can hold. Markets have regained 8.5% over the past 24 hours and are currently at the $330 billion level. All altcoins are recovering during this morning’s Asian trading session, those leading the way with double figure gains include Ripple, Bitcoin Cash, Cardano, Stellar Lumens, Iota, VeChain, OmiseGO, Icon, Zcash and Zilliqa.